Royal Business Forms, in Arlington, Texas, has been in business f or 50+ years, providing customers with custom printed checks, invoices, statements, envelopes, self-stick notes and more. 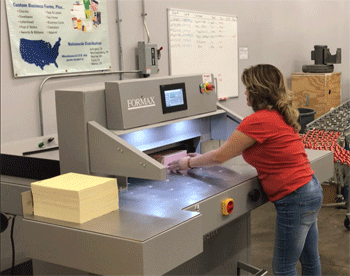 With corporate clients requiring up to 1.5 million checks in a single order, Royal utilizes guillotine cutters on a daily basis. When one of their older cutters had a mechanical failure, and parts were no longer available, they looked to Formax for a new finishing solution: the Cut-True 31H Hydraulic Cutter. We recently spoke with Ronnie Maxey, Office Manager/Sales Manager, who's been in the print finishing business for 32 years. He explained some of the reasons they chose the Cut-True 31H. "Our old cutter wasn't programmable, and had no safety curtain," he said. "In addition, it wasn't very mobile. We rearrange our equipment pretty often, and to move the old one would require renting a 10-ton forklift to move it." Through his years of experience, Maxey said he can easily spot a high-quality cutter. 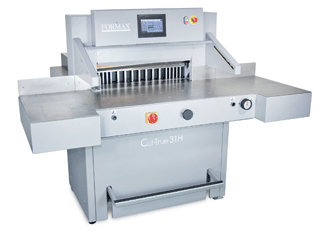 After using the Formax Cut-True 31H, he knew it would be a great addition to their production facility, based on the rugged design, compact size and user-friendly features. Due to an increase in digital printing on smaller sheet sizes, they decided to downsize from their old 42" blade cutter. At first, Maxey was concerned, as "smaller cutters seemed more flimsy and less sturdy." The 31H turned out to be a perfect fit, with the ability to cut sheets up to 28" wide, combined with durable all-metal construction, high-speed hardened steel blade and solid-steel blade carrier. Other cutters in Royal's facility use aftermarket programming interfaces, but Maxey said the 31H is easier to program, especially for new operators. "Recently we've had more temporary staff, not the same operator every day," he said. 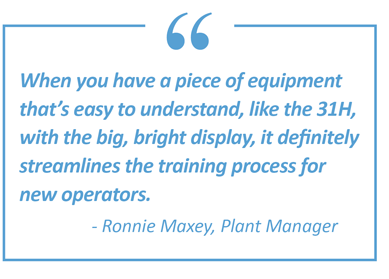 "With equipment that's easy to understand, like the Cut-True 31H, and its big, bright display, it definitely streamlines the training process." Using the intuitive color touchscreen control panel, operators can easily program and operate the 31H. Maxey said he used to view safety curtains as a something that slowed the process, but now he sees how valuable they are, and wouldn't purchase a cutter without one. The Cut-True 31H includes an infrared safety curtain, in addition to dual-button operation, a lock with key, blade change safety tool and wooden paper push. The Cut-True 31H features an anti-friction ball deck with air-assist and extra-large side tables, making it easier for operators to maneuver large paper stock, as he explained. "The air table is especially helpful with close registration on large paper stacks. It helps operators slide the stack in straight" so it's aligned properly with the blade. The LED laser cutting line, foot-pedal pre-clamp and fine adjustment knob also assist operators in making accurate cuts, every time. With a combination of quality construction, safety, accuracy and ease of use, the Cut-True 31H has been a welcome addition to Royal Business Forms, and Maxey said he would definitely recommend it to other print finishing companies.